A Midgett Blog » Blog Archive » Solar Flare! The United States Department of Homeland Security has turned its attention towards the Sun this week in an attempt to determine the cause of some anomalous solar activity. President Bush has authorized a country-wide elevation of status to Yellow Alert until terrorist activity can be conclusively ruled out. For the past two weeks, scientists have been reporting an unprecedented rise in the amount of solar activity coming from our Sun. This atypical activity began with a series of four flares on Oct. 22nd and ended 13 days later with the largest flare recorded since satellite observations began in 1976. “It’s like the Earth is looking right down the barrel of a giant gun pointed at us by the sun… and it’s taken two big shots at us,” said John Kohl of the Harvard-Smithsonian Center for Astrophysics last week. Because the Sun reached the peak of it’s 11-year activity cycle in late 2000, scientists are at a loss to explain this sudden rise in solar flares. “I have not seen anything like it in my entire career as a solar physicist. The probability of this happening is so low that it is a statistical anomaly,” Kohl added. It’s precisely that low probability that has the government worried. NOAA scientists confirm that such solar activity will likely result in noticeable repercussions here on Earth. 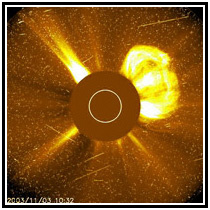 One of the larger solar flares in the series resulted in a coronal mass ejection (or CME) of over two billion tons of solar material that was hurtled towards our planet. Even with the advance warning of the SOHO Spacecraft, installations here on Earth typically only have a few hours’ warning before the arrival of the highly charged particles. The most noticeable result of these fast moving particulars coming into contact with our atmosphere is an increase in the colorful Northern and Southern Lights or Aurora Borealis and Aurora Australis. “Shock and Awe” refers to the war plan used by the United States against Iraq. In March, the greater American force struck cities and military installations with an unprecedented number of guided cruise missiles. By using overwhelming force, the plan focused on the psychological destruction of the enemy’s will to fight. But the confusion caused by the Northern Lights appearing as far south as Texas is not the government’s greatest concern. Scientists and space weather forecasters warn that severe geomagnetic storms caused by the CMEs could disrupt radio communications, disable satellites, and even knock out power grids. Smaller solar storms have wreaked havoc in the past. In 1994, a solar flare caused problems with communications satellites and disrupted television and radio signals in Canada. In March of 1989, the Hydro-Quebec power grid was knocked offline for over nine hours after an X15 flare was recorded. The potential of energy of our Sun is staggering. Over one million Earths could fit within its 1.4 million kilometer-wide sphere and the nuclear energy generated each second is more than that of 100 billion tons of TNT exploding. Proportionally small CMEs directed towards Earth with a rating of only X1 can have noticeable repercussions and in the past two weeks SOHO has recorded an X10, X17.2, and an almost off-the-scale X28. “Whatever it costs to defend our country, we will pay,” President Bush added. “We will use the extra funds to improve intelligence, tighten border security, and develop countermeasures against possible attacks directed at us from the Sun. This reads like an news item I might find with an AP tagline. The quotes from Condi Rice and Pres. Bush sound quite in the dark (so to speak). Did you assemble all this data yourself Ace? It depends on what you mean by "assemble." Yes, I did research the solar flares quite a bit online. I also dug up and read a few articles about "shock and awe," "the axis of evil," and one of the President’s past State of the Union Addresses. But are the quotes real? Yes and no. Most, if not all, of the scientific ones are. One or two of the political ones are actual quotes, obviously taken out of context. The rest… I just made them up and tried to make them sound somewhat believable. My goal was to try striking a balance between the "newspaper style," and flat out goofiness. At the end, I wanted to make people think: That wasn’t real… was it? Where did the idea come from? I remember an article on Space.com that talked about the flares. Two things stuck in my brain — the improbability of this happening and the AWEsome expected Aurora effects. "Shock and Awe" popped into my head and, a couple seconds later, the rest mentally fell into place. I had fun researching and writing this article, but I don’t think I’d ever want to be a reporter/writer for the media.